I've been gardening a lot lately...in the rain, in the sun (very occasionally), in the cold, in the wind. We gardeners are a devoted lot. In the photo above is a very beautiful Japanese tree peony in our front yard. 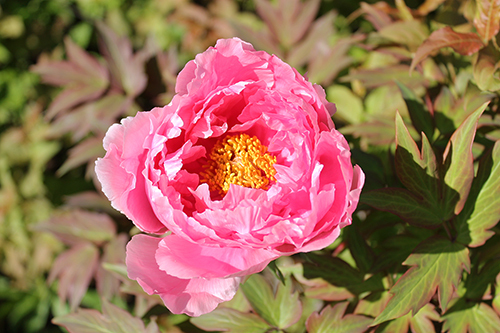 Tree peonies' petals are slightly more papery than their herbaceous relatives. This particular peony has dealt graciously with me moving it at least twice during its life. For as much as I've done in my garden so far this year (lugging bags of dirt, buying and transporting flats of annuals to their appointed place, enriching the earth, dividing perennials, trimming shrubs, planting pots, digging out weeds...), there is still much to be done. 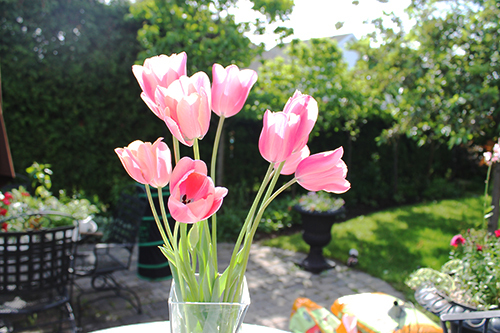 Some beautiful 'Candy Kisses' tulips in front of some finished pots, a table full of annuals still to be planted and bags of earth and compost still to be spread in the vegetable garden. I have often said that I prefer gardening to housework. Housework achieves five minutes (perhaps) of neatness and cleanliness only to immediately spiral back into disorder and dirt. Physical effort in the garden however, although it never ever quite achieves perfection, contributes to long lasting beauty. Yes, the weeds will come back and things will need to be tended but a garden responds to your care. You can see an immediate and a lasting response. "A garden can be a perfect metaphor for our lives. We figure out the conditions, try to improve them if possible and then deal with them and try to create something beautiful." 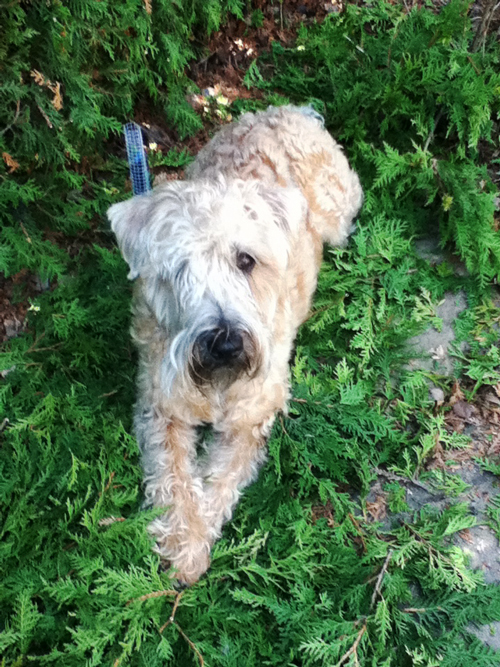 I think that is one of the most valuable lessons from our gardens--that we are not in complete control. A garden teaches patience. When we moved into our house, it was a new subdivision. Our lot didn't have even one tree. It was basically a pile of dirt the first year that we lived here. I hated it but starting a garden didn't make sense with a new baby. It was the second year that we lived here that I created the garden design. There are flower beds wrapping the house and the entire outside perimeter of our lot. They are everywhere. On a day when I was feeling more than a little tired recently, I complained to a friend that the garden (that I designed) is 'too damn big'. She responded '...and you love it'. The back flower bed in our garden freshly weeded and trimmed. We have been in this house for almost 15 years. We moved here a month before Chloé was born. She will be 14 in July. Even more immediate, Emma will be 18 on Saturday. And my husband and I celebrated our 19th wedding anniversary yesterday. How time passes. 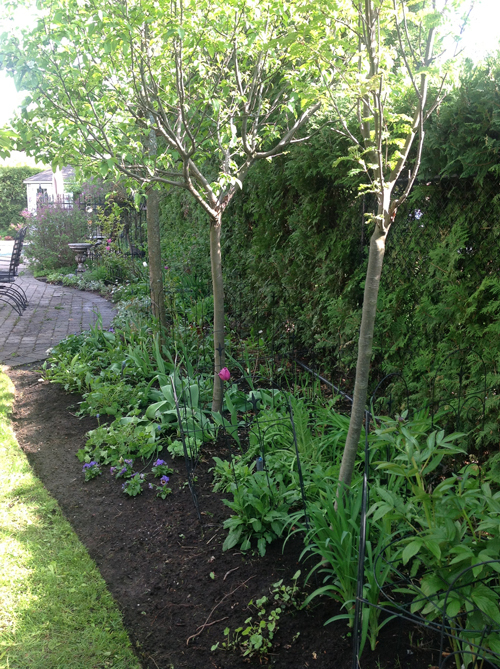 When I have toured the garden the past few weeks, I can't quite believe the growth of the trees and shrubs. From our flat, bare lot, we now have leafy, natural canopies over sitting areas where there was nothing before. We have privacy from neighbours where intimacy was previously just a wish. I have put my heart and soul into this garden and I have been rewarded. This living, beautiful thing that surrounds us has changed and matured, just as we have. The past couple of days I have been holding my breath more than I have been breathing. 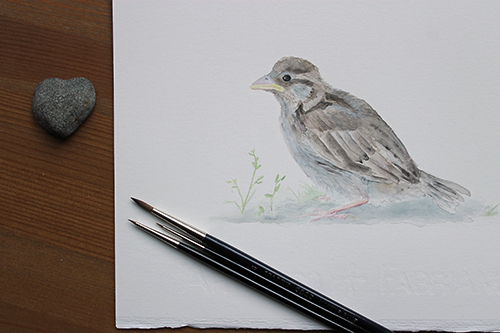 I have been painting my baby sparrow, the one who was in our backyard this past weekend. I have painted many, many more flowers than I have birds over the years. I painted my little chickadee last year. 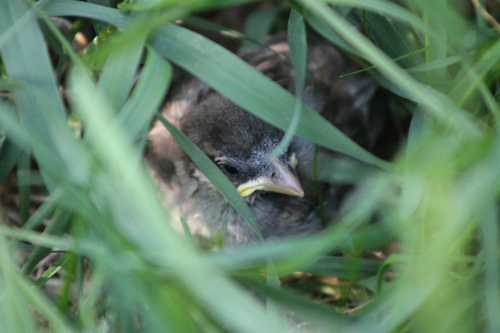 And now I have a baby sparrow. I painted a snow bunting who visited our yard a couple of years ago but I won't even show you that painting. I'll have to try again. I tried to give the sparrow definition at the same time that I tried to retain his fluffiness and softness. I used watercolour with a tiny bit of gouache at the end for highlights. There are some progress shots on my Instagram account. I really hope that you like him. I feel proud of this one. It's giving me the courage to try to paint more of my backyard friends. I have a big stack of paintings that need to be converted into prints for my Etsy shop. I think I'm going to put this little fellow towards the top of the pile. Painting has help me recover from all of the physical work in the garden this past weekend. But now I need to turn my attention back to the garden. There is planting to be done. Some big, black clouds have just rolled in. Stormy weather is actually a great time to go to garden centers (if there is safe cover) as you will find that you almost have the place to yourself. There was excitement in the backyard yesterday. 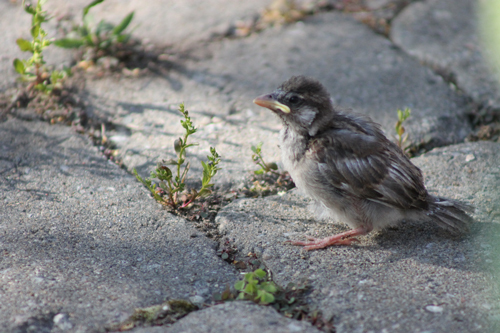 I looked out and saw a tiny baby sparrow hopping around on our back patio. One of its parents was beside it. I ran for my camera and kept my distance while taking some photos but my presence was enough to scare it. It went scurrying into our long, not-yet-cut grass. At that point, its parent was no where to be seen. I felt so bad. I was worried that Meeko might find it, so we kept him in the house. Then I worried that someone would step on the poor thing because it wasn't obvious at all where it was. I ended up putting a metal fence around the area where it was hiding as a reminder to us of where it was. 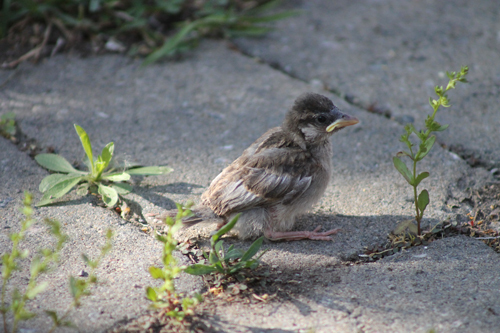 Then I went to garden on the other side of the yard to give the little sparrow time and space. Emma was inside the house and monitored it from there. She googled baby sparrows as we weren't sure if it had fallen out of one of our birdhouses or if it was really time to fly. She found that if it had feathers (which it did) that leaving its house was most likely intentional and it would soon be able to fly. Sure enough, a little later our little fellow was gone. The downward crook of its beak makes it look a bit sad or at least very serious. I suppose in a sparrow's life, the first day of flying is very serious and I'm sorry that I added to this little one's stress. I am happy however to have photos of him and think I will try to do a painting of him. Right now though, I have a few more days of gardening ahead of me. Along with getting my garden on its feet (that's an odd idiom), I have succeeded in painting a little the past week. I get so torn this time of year. Garden? Paint? Garden? Paint? Some of the spring flowers are so fleeting that they need to be painted or else I have to wait for next year. But my garden can run away on me (those feet again) if I don't get it under control at the beginning of the season. Our back lawn is covered with wood violets right now. They are so pretty and I much prefer them to the dandelions which are also vying for my attention right now. 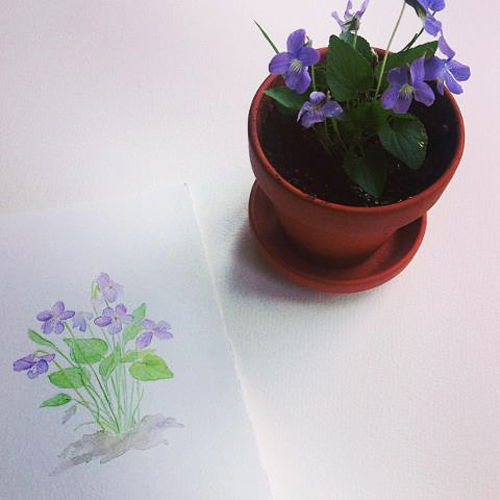 I dug out a little clump of the violets and potted them so I would have to time to paint them. I am not a quick painter. I never have been. Too detail-oriented for that I guess. Below is my painting in progress and at the very top is my finished wood violet study on Twinrocker hot-pressed watercolor paper. The paper wasn't completely flat when I finished the painting so I placed it under a pile of big art books. I really didn't pay attention to them at the time. They were serving a utilitarian rather than literary purpose. 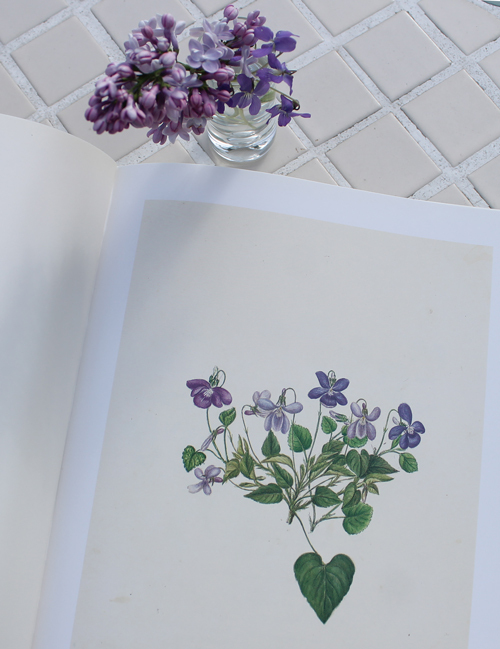 It was only when I retrieved my painting afterwards that I noticed the top book "The Flowers of May" with a watercolour painting of violets on its cover! I had distractedly chosen the perfect paperweight! 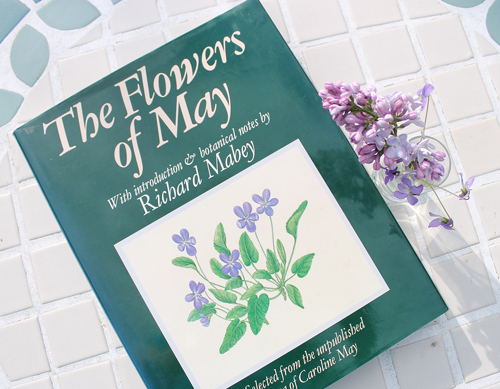 While it would be easy to assume that "The Flowers of May" is a celebration of this month's flowers, it actually pays tribute to a wonderful botanical artist named Caroline May who lived from 1809 until 1874. She painted delicate, beautiful watercolours of British wildflowers. About a thousand paintings of her paintings have survived. This book contains reproductions of ninety of them. I hadn't looked inside this book in years. 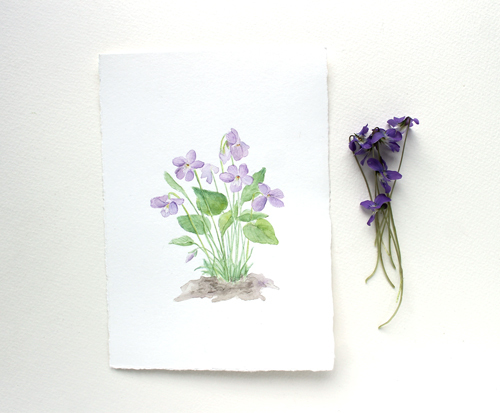 Look at Caroline May's painting of wood violets that she refers to as 'Dog's Violet'. Isn't it lovely? I'm so glad I saw it after and not before I had completed my own painting. It was a beautiful moment of serendipity in my week. Within the same lovely purple palette, my lilacs (Syringa vulgaris) are in full bloom right now. I adore their fragrance and can't resist burying my nose in them each time I pass. You do have to be careful though. Yesterday my nose came very close to a giant bumble bee! I am very fond of purple, especially blue-purple. My favourite colour is periwinkle (which is somewhere in between purple and blue). 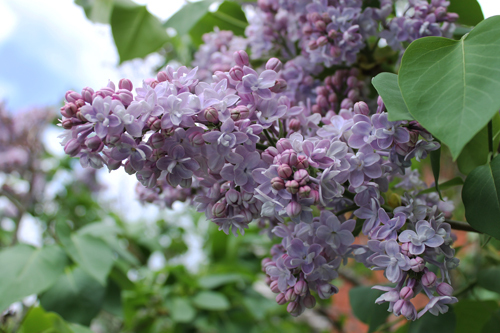 The lilac blooms have wonderful combinations of purple, blue and hints of pink. 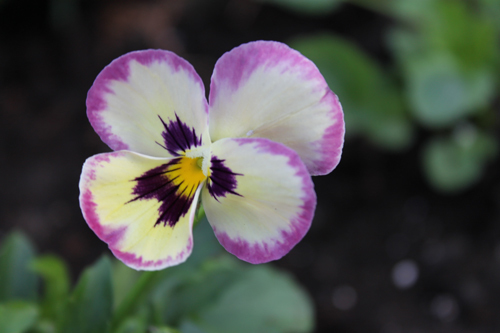 It's just amazing the gradation of colour in each little blossom. 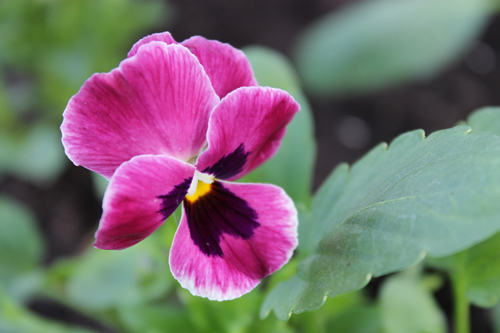 With their scent and colour, they are pretty close to a perfect flower for me. 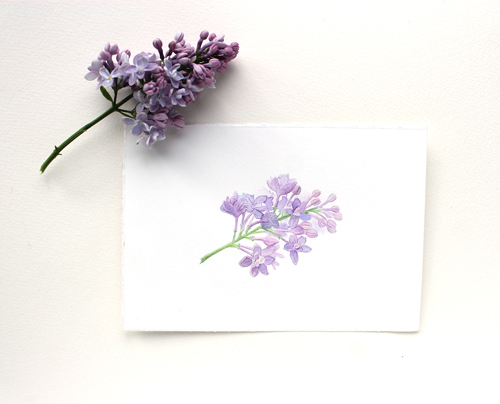 I picked a small lilac sprig to paint. I actually had to pick more than one over the course of finishing my painting as lilacs wilt very quickly. Meeko's not my only companion in the backyard while I garden. I am frequently visited by some very beautiful friends! 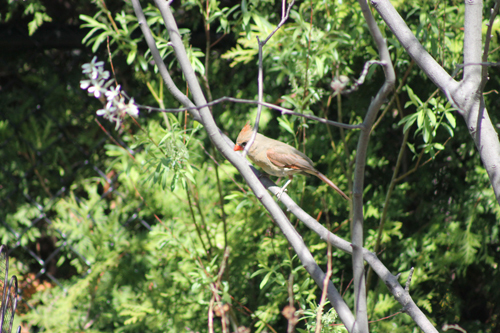 Mr. and Mrs. Cardinal are above and below. 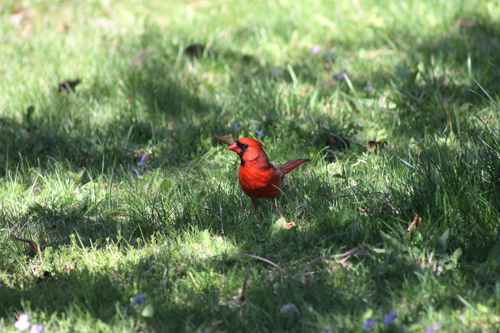 What a handsome fellow the male cardinal is. The female is very lovely too in a more understated way. They are such sweet, polite birds. They always arrive together and gently chirp (pip, pip, pip) when they find that the seed tray is empty as if to say "We had hoped to have a little snack, but don't worry we'll drop by again." They are nothing like the beautiful yet very bossy blue jay who will screech from the top of the tree: "Hey lady, I thought I told you that I like the seeds put out before I arrive!" 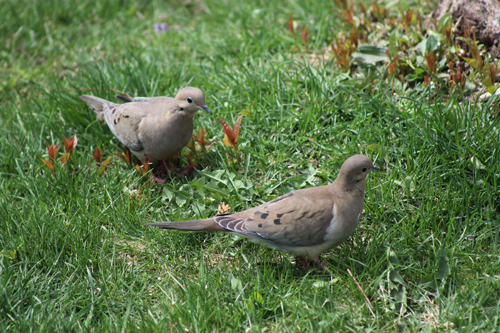 Other birds who tend to visit as a couple are my lovely mourning doves. They are not hugely brilliant or maybe they just don't see well. It's not too hard to surprise them. But they are so pretty and I love their goofy charm. 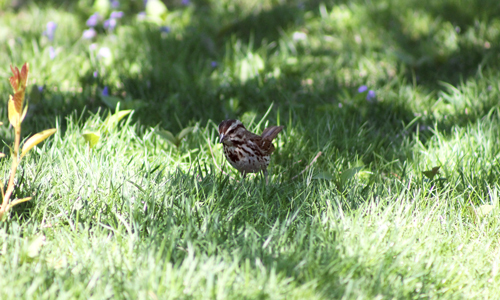 Finally, this is a sweet little song sparrow. I love its striped and speckled markings. I often hear him before I see him. He is a very gifted singer and he serenades me (I like to think it's me) on a regular basis from a neighbouring tree. I am constantly amazed by the beauty in nature. 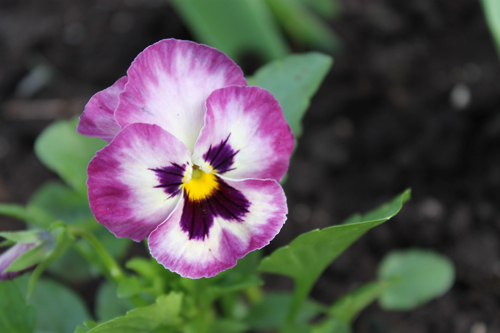 I love looking closely at flowers and admiring the lines, colours and textures of each bloom. 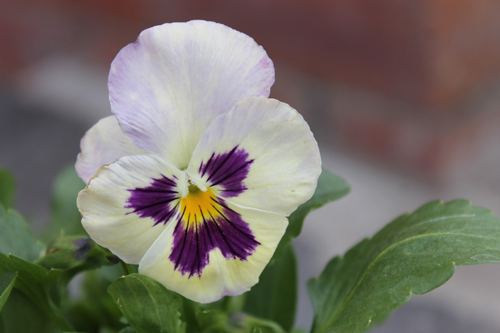 Of all of the flowers I know, I think pansies remind me the most of watercolours. Don't you think Mother Nature must have her own extra special paintbox? 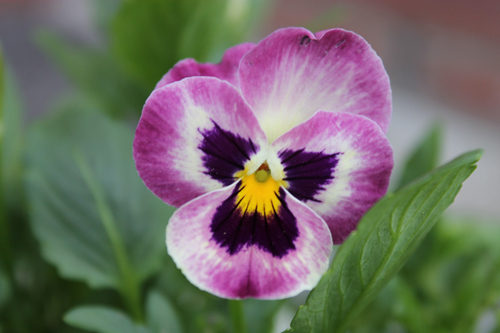 I have painted a lot of violas and pansies over the years. They are such happy flowers. You can click here to see a few of my prints featuring them. If you are relatively new to my blog you won't know this special connection. One of my grandmothers was named Viola. I have been so busy this past week with the spring cleanup in my garden that I haven't had a paintbrush in my hand once! I have so many flower beds that it takes at least five full days to clean everything up. I filled 20 big garbage bags with clippings and garden waste for the municipal green pickup! You should have seen the pile at the curb. I feel like I should have got some sort of Amazon woman award for that! Once the beds are presentable again, I will move my attention to my beloved square-foot vegetable garden. After the slow, cold beginning to the spring, this week has been remarkably sunny and warm. If you blink, you can miss an important change in the garden. Leaves have opened. Flowers are blooming. 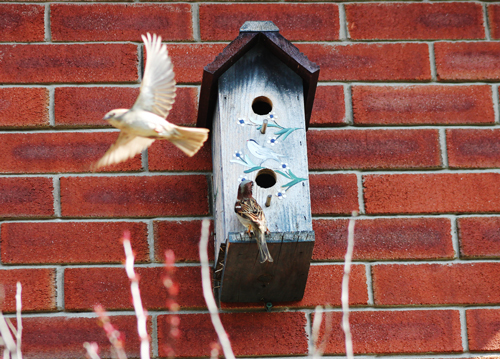 We have our first sparrow family too. It's a beautiful time of year.